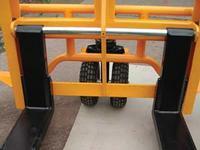 Adjustable Overall Width Forks - 9 1/2 to 26"
Model V-ALL-T-2 - 2,000 lbs. at 12" horizontal load center, 1,500 lbs. at 15" and 1,000 lbs at 24". 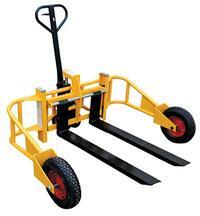 Model V-ALL-T-HD - 2,500 lbs. at 12" horizontal load center, 2,000 lbs. at 15" and 1,500 lbs at 24". Model V-ALL-T-2-48 - 2,000 lbs. at 24" Horizontal load center, 1,500 at 1,500 lbs. Inside Dimension - 50"; Outside Dimension 64"
Service Range 3" to 9"
Model V-ALL-TTB (Pic. 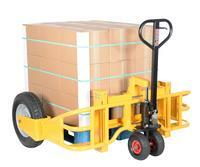 3) - Optional Tow Bar Package allows the All Terrain Pallet Truck to be towed by any ATV or small utility tractor.